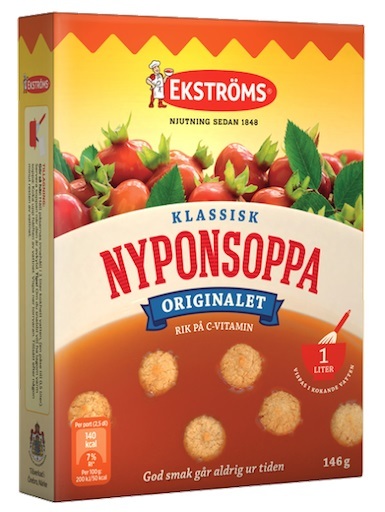 Ekstroms Nyponsoppa Originalet - Rose Hip Fruit Soup, 5.1 oz / 146 grams. Nyponsoppa is a rosehip soup rich in fibre and a great source of vitamin C. It's a nice snack or hot beverage and served with almond macaroons and ice cream it makes for a great dessert. Whisk powder with 4 cups of boiling water, serve once when cooled.